Delaware Storefronts, LLC also creates custom glass table tops and mirrors. Glass tabletops offer many benefits over wood or metal tabletops. They are easy to clean, reflect light, and in most cases, they can be removed from the table frame for easier transporting. Delaware Storefronts, LLC creates custom glass tabletops for any table shape and size. We install table tops for dining room tables, coffee tables, end tables, patio tables, and more for homes and any type of business, including restaurants and hotels. Your table top can be clear, frosted, etched, or tinted. Bring us your table dimensions, or we can come to your home or location to determine the glass size and shape you need. The professional glass manufacturers at Delaware Storefronts, LLC also design and install mirrors, with or without frames. 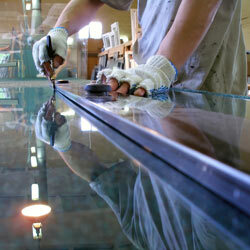 Mirror glass is glass that has been coated on the back with silver to make the surface reflective. 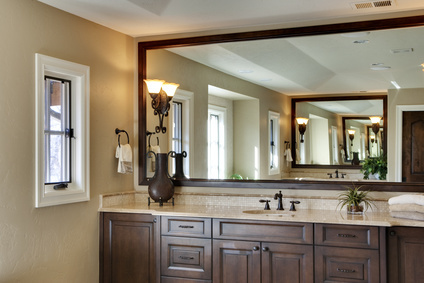 From simple and purely functional to works of art, we install wall mounted mirrors and mirror with stands for your bathroom, hallway, foyer, or bedroom. We also offer commercial mirrors for dance studios and fitness centers, along with public restroom mirrors, and other specialty mirror designs.